The Traffic Light Guides: A clear, easy way to classify foods, to help people with diabetes make healthier food choices. Diabetes is a condition where it is difficult for the body to control the level of glucose in the blood stream. This may be because not enough insulin is produced by the body or the insulin that is made does not work properly. Insulin is a hormone that is made in the pancreas. Its job is to move glucose from the blood stream into the muscle and fat cells of the body, where the glucose can be used for energy. A healthy diet is one of the cornerstones in the management of type 1 diabetes. In this section of the books you will learn all about a healthy diet and the nutrients in food: carbohydrate, fat, protein, fibre, vitamins, minerals and many more. With diabetes, understanding carbohydrate is vital to helping you manage your blood glucose levels. 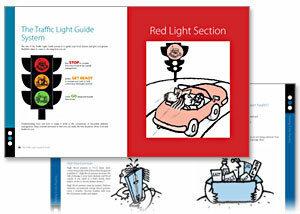 The Traffic Light Guide books are for anyone with diabetes and those who are involved in their care. RED These foods are also called 'sometimes' foods. They can be eaten as part of a healthy diet but it is important to consider how much and how often. AMBER Carbohydrate foods, which play a big part in managing blood glucose levels. They can also provide energy, fibre and many other important nutrients. GREEN These are also called 'free' foods. This is because they should have little effect on your blood glucose levels and kilojoule intake.